HARD-UP residents on benefits in Worthing will have to pay £5 per week towards council tax but Adur residents will not, after councillors disagreed over policy. Worthing Borough Council cabinet members sided with a public consultation in favour of introducing the charge, despite warnings it could increase debts and homelessness. In the same meeting last Wednesday, Adur District councillors opted against the charge, over concerns for low-income families. Worthing leader Paul Yallop said: “There are passions on all sides and I have seen some evidence as to what hardship that might cause. 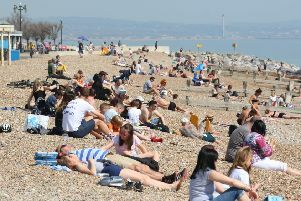 A consultation across Adur and Worthing revealed 80.6 per cent in Worthing and 81.4 per cent in Adur believed everyone should pay something. Members of both councils had a lengthy debate at the Joint Strategic Committee meeting. Manor councillor Keith Dollemore agreed. He added: “I work a lot with people that are very short of money and have great problems managing debts. On the Worthing side, Castle councillor Daniel Humphreys acknowledged £5 was a lot of money but felt the result of the consultation should be accepted. Worthing cabinet member for customer services Mary Lermitte agreed, but wondered if there was room for discretion in certain cases. Central councillor Clive Roberts said: “I am astonished. Back in the summer, I was given 200 cigarettes and I didn’t know what to do with them as I didn’t smoke. A report presented to the committee admitted that while the charge was financially appealing, there was evidence residents could suffer hardship, increasing pressure on other council services. Steve McCarthy, specialist adviser at Central and South Sussex CAB, said similar charges across the country had caused a ‘great deal of hardship’ to a significant number of people. He said: “In our experience they cannot find the extra money to pay it, as they are on a very low income already and may also have been hit with bedroom tax reduction and increased utility bill costs. Anyone who may be affected by the change, which will come into effect in the next financial year, should call the CAB on 0344 477 1171.